In this post, Bill discusses catheter options for individuals living with limited hand dexterity, such as quadriplegics and other spinal cord injured people, as well as those living with arthritis and other conditions that affect the hands and joints. Bill’s passion in life since his spinal cord injury after a motocross accident has been helping others transition to life using urinary catheters with limited hand dexterity and mobility. If you have a new spinal cord injury, part of your rehabilitation will involve learning new skills such as how to self-cath. Don’t feel discouraged if you can’t get the hang of it immediately. Even with limited hand dexterity, it may still be possible for you to self-cath. It just takes time, patience, and practice. Finding the right catheter option that works best for you is an important part of learning to self-cath on your own as well. Bill talks about several intermittent catheter product options for limited hand dexterity that are available to order from 180 Medical, and his input is based entirely on his personal experience living as a quadriplegic who self-caths every day. Intermittent straight catheters are considered the original catheter technology. These may be a good option for those who are unable to obtain closed system catheters or hydrophilic/pre-lubricated catheters through their particular insurance plan, since straight catheters are rather inexpensive. Straight catheters require manual lubrication prior to insertion. Those in wheelchairs who may not be able to easily transfer from their chair to a toilet may also want to consider getting catheter extension tubes. For people with a spinal cord injury or limited hand dexterity who use intermittent straight catheters, I would say the biggest hurdle is finding an easy way to open the sterile lubricating jelly packets. The best option I have found is to carry a small pair of trimming scissors with you (if you are able to manipulate them) to cut the catheter lubricant packet open. 180 Medical offers a few different options of lubricating jelly packets, and it may be a good idea to just try out a few types to see which are easier to open for your individual needs. TIP: The easiest way I’ve found is to use a tube of lubricant. The only issue with this is if you’re interested in trying a more advanced catheter, Medicare guidelines require you to use a one-time-use packet with every catheter and using a tube is not considered sterile. Depending on your insurance coverage, you may be eligible for an intermittent catheter that is considered more technologically advanced than standard, uncoated catheters that you have to manually lubricate. Hydrophilic catheters have a special coating that is activated by water, so they can be a fast, less messy, and more convenient option for some. Hydrophilic catheters don’t require additional lubricating jelly. Some brands are pre-activated in their own solution and come ready to use right out of the package. 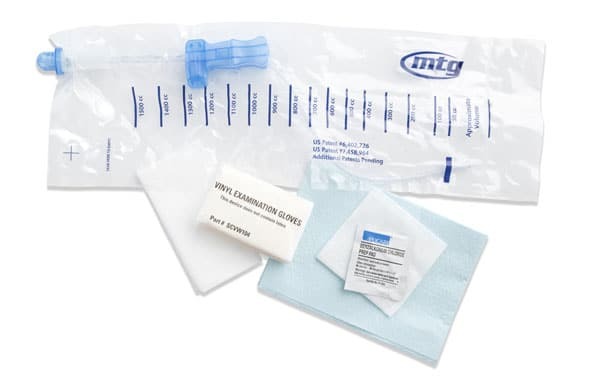 Others may include a sterile water packet that you pop to let the catheter saturate for a short period of time (usually no more than 30 seconds) in order to activate the hydrophilic coating. Once activated, hydrophilic catheters are very slippery, which may make them more difficult to hold on to for those with a spinal cord injury or quadriplegics with limited hand dexterity. Some of these catheters have specialized grippers or sleeves, which make them easier to grasp. TIP: Some people with dexterity issues may have a hard time popping the water packet. I find that I can pop it by placing it in between my two palms and pushing them together to squeeze it open. Other people may prefer to lay the package on the table and put pressure on the packet to pop it. I personally prefer closed system catheters. For me, closed systems are simply the most convenient option, especially due to my limited hand dexterity and being a quadriplegic. It’s also great for travel or if you’re in a public restroom, because it keeps the catheterization experience virtually touch-free, which reduces the risk of contamination from your hands which can lead to infection. Closed systems make great travel catheters, since they can be fairly easily packed in baggage, including carry-on luggage. They’re also perfect for just being on the go, especially when you’re traveling or away from home and have to use public restrooms. Because closed system catheters are all-in-one products, you will be able to keep your catheterization experience virtually touch-free, which reduces the risk of contamination from your hands. 180 Medical carries a very wide variety of all of the major catheter brands, so it’s hard to mention just a few, but I will say that one of the popular catheter options for someone with very limited hand dexterity, whether male or female, is the MTG EZ-Gripper®. The latex-free MTG EZ-Gripper® is designed specifically for people with limited hand dexterity. It’s a self-contained, pre-lubricated closed system catheter, and it features MTG’s patented EZ-Advancer® to help move the catheter forward and guide it into the urethra without the catheter retracting back into its bag. The packaging also has finger-sized holes to make it easy to open and hold. Another popular catheter for limited hand dexterity is the Coloplast Self-Cath Closed System Kit. 100% Silicone, latex-free unisex catheter system designed to reduce the occurrence of urinary tract infections and reduce trauma to the urethra. It features an Easy-off tear tab, which makes it easier to use even for those with limited hand dexterity and includes insertion supplies. I use a closed system catheter called the Rusch MMG H2O® Hydrophilic Closed System Catheter. It’s my preferred catheter of choice, because it goes in easier for me due to a slight urethral stricture I have. There are also catheterization devices that can assist you during self-cathing. These devices can be used to manipulate and have better control over the catheter to hold and insert it more easily. You may want to look into the quadriplegic catheter inserter, which is designed specifically for quadriplegics. It is a spring-loaded clamp that fits around the catheter to help you grasp it. Another new option you may want to try is the MTG Eagle™ Board. You can learn more about that device in a blog feature by fellow quadriplegic and blogger, Mason Ellis. When you call to order your intermittent catheters from 180 Medical, you can rest assured that the team of trained and understanding catheter experts on staff are ready to assist you throughout the entire process. Contact us today to experience the 180 Medical difference!